Stage West + FWISD ! 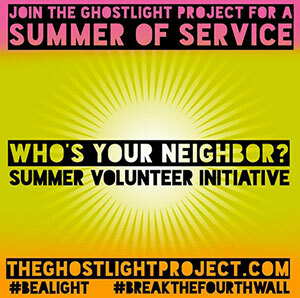 Stage West made a commitment back in January with the Ghostlight Project to increase the ways that we give back to our community, especially those portions of our community that have been historically disadvantaged. We each started planting seeds. While doing a College and Career Readiness Session with a lovely group of young women at Morningside Middle School back in February, our Marketing Director was approached to see if Stage West would be interested in participating in a similar summer program. Would we? Of course we would! How wonderful! The FWISD IROC program (I’m Ready for the Opportunity of College!) is a summer camp facilitated by the Fort Worth ISD Academic Advisement Department. IROC! helps middle school students investigate their potential for college attendance and career exploration. The program involves visiting a variety of business environments as well as participating in local service projects. It has proven to help keep students on a college track, particularly among minority and first generation college students. Our IROC! camp will be Thursday, July 6. In these interactive sessions, the staff at Stage West will offer students an overview of potential careers in the performance, technical, and business aspects of theater arts. Executive Producer Dana Schultes, actors Garret Storms and Mark Shum, Stage Manager Tiffany Cromwell, Education Manger Andrea Gonzales, Technical Director Ryan McBride, and Marketing Director Jen Schultes will engage with over 100 8th grade students over the one day event. From Q&A sessions to improv games to branding basics, we have pledged to pull back the curtain on a world of careers in the arts and arts management spheres. The participating students will be representing Leonard Middle School, Kirkpatrick Middle School, Meacham Middle School, Rosemont Middle School, Rosemont 6th, Daggett Middle School, Morningside Middle School, Forest Oak Middle School, Jacquet Middle School, William James Middle School, Meadowbrook Middle School and Handley Middle School. We are so excited, We can't wait to share what we have learned in our careers, to help the younger generation achieve their dreams of college and careers, whatever path they take.